As politicians on both sides of Pennsylvania Avenue perform the strip tease regarding the avoiding Fiscal Cliff, it is worth stepping back to chuckle and simultaneously smirk at what brought us here. When commenting on the Capitol Hill streaking spectacle, former Senator Alan Simpson (R-WY) quipped at a Christian Science Monitor luncheon about the difference between being "naked" and "nekkid". Obviously from the messages on their backs, they were up to something. 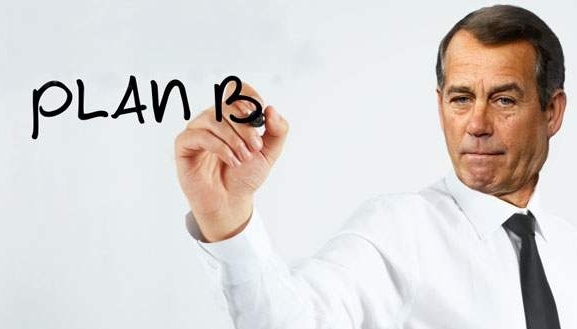 During his successful 2008 Presidential campaign, candidate Barack Obama promised to double spending on world AIDS prevention from its FY 2009 level of just over $20 billion to $50 billion. In FY 2009, the last year the Democrats in the Senate deigned to do their duty and pass a budget, AIDS funding increased to $25 billion. Since both President Obama's subsequent budgets failed to get a single vote and Senate Democrats did not approve a budget, AIDS spending went from $23 billion to close to $24 billion. Yet the nekkid "happening" was at Speaker Boehner's office allegedly to protest a 10% across the board spending cut. Out on the 2012 campaign trail, President Obama urged raising taxes on the top 2% of taxpayers (who currently pay 45% of all taxes) from the Bush tax tables which was supposed to raise $800 billion over time. But the nekkid truth is that once Mr. Obama was re-elected, his naked ambition was to double revenues to $1.6 trillion, along with another stimulus package, the ability for the Executive Branch to unilaterally raise the debt ceiling and without any spending cuts in the first eight years of the ten year plan. Republican have been desperate not to take the blame for going off the Fiscal Cliff and have further draconian cuts to an already emaciated armed forces along with resuming Clinton era tax rates with Obama era federal spending. Prior to Christmas, Speaker Boehner was even willing to adopt Rep. Nancy Pelosi's proposal of raising taxes on true millionaires (not those making $250,000), but "Plan B" was summarily rejected by Democrats and more importantly by the important tea party elements of the GOP caucus, who were not anxious to take the blame for willingly raising taxes. 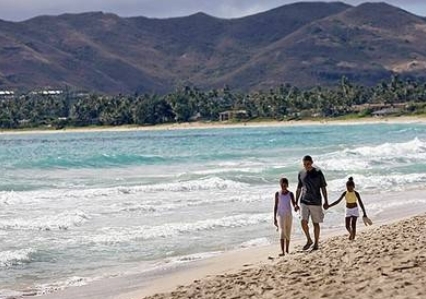 Typical of his governing style, President Obama had a hands off approach to budget negotiations when he went on his Hawaiian holiday. When the President showily returned to the District of Calamity for budget talks, he gathered politicos for a photo op, offered nothing new and dictated how Congress should legislate by demanding an up and down vote, which might not even carry the upper chambers majority caucus. Speaker Boehner called back House Members on Sunday afternoon in case there was a legislative compromise. Senate Majority Leader Harry Reid (D-NV) and Senate Minority Leader Mitch McConnell (R-KY) have tried to craft a last minute compromise. It would not be surprising if the proverbial can gets kicked another month down the road. But the naked truth is that Americans (even the top 2%) are not undertaxed, but that the federal government is spending too much. Unless politicians on Capitol Hill and the White House make real spending reductions, the US will not just go over the fiscal cliff but we will go into the abyss which would drive a world-wide depression, significant currency devaluation, inflation and devastating cuts in an already weakened military still on a war footing and no money for discretionary programs like world AIDS funding et cetera. So expect lawmakers to realize that they are "nekkid" and find a fig leaf. The problem is that such a fig leaf of a plan essentially covers nothing and may get everyone banished from the land of the free and the home of the brave. Is that what we really want or what we voted for in November? 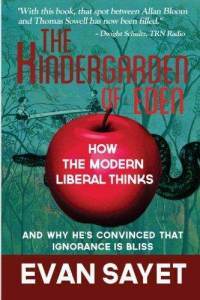 Evan Sayet wrote an extended essay entitled The KinderGarden of Eden– How the Modern Liberal Thinks And Why He’s Convinced That Ignorance Is Bliss (2012). This serious pensee of political philosophy was written by a stand up comedian originally championed by David Letterman and who cut his teeth in Hollywood by contributing to the successful Arsenio Hall Show and Politically Incorrect. Despite his comedic credentials, Sayet can be a serious political thinker. Since then, Sayet’s speech is a viral video which has received over 700,000 hits, which is quite remarkable for a 43 minute talk on political philosophy. Sayet labels himself a 9-13 Republican, as the self described New York Jew was appalled that liberals embraced the concept that America “deserved” to be attacked on 9-11. 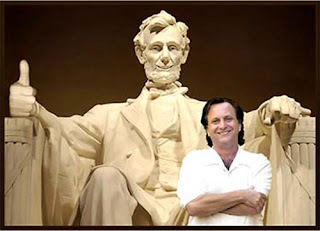 This prompted Sayet to recognize that: “[L]iberals- were not only taking the side of evil, but they were often making the most objectively false and evil anti-American arguments in order to do so.” Sayet concluded that the Modern Liberalisms blueprint for Utopia is to totally regress humanity to Adam and Eve. Since progressives would shudder at such a non-secular metaphor, they would want everything to be like a five-year-old in a garden paradise–hence The KinderGarden of Eden. 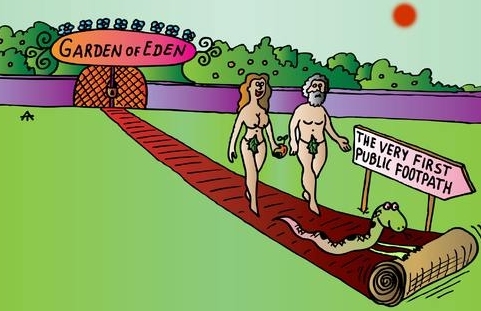 The KinderGarden of Eden is careful not to condemn liberals with a broad brush. In fact, Sayet points out that a classical liberal would be alienated from the Modern Liberal. President John F. Kennedy who espoused “Ask not what you can do for your country, but what your country can do for you.” is in sharp contrast to the Modern Liberals inclination to be a Citizen of the World who expects the country to do everything for you. Sayet’s Unified Field of Liberalism theory posits that Modern Liberals believe that it is imperative to totally reject the intellectual process. However Modern Liberals’ indiscriminateness leads to the lesser over the better, the wrong over the right, and good over evil. Sayet posits that Modern Liberal policies occur in tandem so each effort on behalf of the lesser is met with an opposite campaign against the better. Lastly, there is a Wonderland effect where Modern Liberal will ascribe to the better the negative qualities associated with the lesser and vice-versa. Sayet wrote a wonderful succinct summary of how we intellectually got to where we are. Sayet showed how thinkers until the Enlightenment esteemed both science and the extra-scientific (such as morality, love, beauty, justice and mercy). The Enlightenment rejected any qualities that could not be quantified. This impetus for emperical authority lead to Rousseau’s push-back which sought to replace science with innate passions. Sayet claims that Dawinian extension of the “survival of the fittest” was epitomized in the Holocaust, which led Modern Liberalism to reject both God and science. So Sayet contends that the Modern Liberal prize indiscriminateness, which presumably is reflected in deconstructionism and amorality. Sayet is forthright with his readers that The KinderGarden of Eden is a work in progress which he intended to publish next year. However, Sayet was convinced to publish volume one now just after the 2012 election so that his work was it is considered a timely pensee on political philosophy rather than as a political polemic. I look forward to reading Sayet’s extended exposition as the ideas in The KinderGarden of Eden were influential but not always quotable in this extended essay. Although both the Eastern and Western Churches have ascribed to the sinless conception of Mary the Mother of God, it dogmatically proclaimed as the Immaculate Conception until the 1854 ex cathedra papal bull Ineffabilus Deus by Pope Pius IX. Due to unclear contemporary catechisis, a minimization of Mariology and its place on the liturgical calendar near the start of Advent, the Solemnity of the Immaculate Conception can be mistaken as the sinless conception of Jesus rather than His mother Mary. As a child of Vatican II, I struggle with mystagogical necessity of the Immaculate Conception--how can our sinless savior be born from a Mother with sin? Nevertheless, I accept it as a mystery of faith which I may not wholly appreciate but that I believe. Perhaps a better way to understand the Immaculate Conception is through an Eastern approach. On December 9th, Orthodox Christian Churches celebrate the Conception of the Most Holy Theotokis by St. Anne. 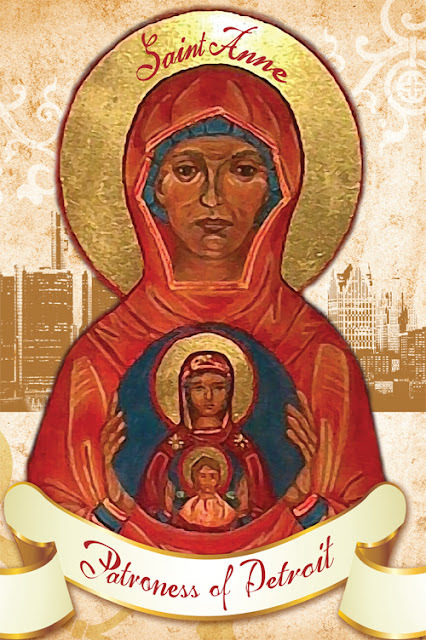 Celebrating St. Anne should have significance to the City of Detroit, which the Vatican named as its patroness in 2011. One of the common synonyms for Mary the Mother of God is as Theotokis or god-bearer. To me, that semantical construction god-bearer calls to mind the Ark of the Covenant from the Book of Exodus, where God dwelled among His people. This is rich with symbolic significance and points to our Savior. Typically we think of the Immaculate Conception as Mary, the Mother of God, being born without sin (the unblemished Tabernacle for the Incarnation). That being said, it seems more useful to consider Mary as being full of the Holy Spirit. So rather than focusing on herself, she could magnify the Lord through her son Jesus Christ. So to celebrate the Conception of the Theotokis by St. Anne and its consequence, we can reflect upon portions of the Orthodox Divine Liturgy as scored by Arvo Part. Rejoice, O virgin Mary, full of grace, the Lord is with thee: blessedart thou among women, and blessed is the fruit of thy womb, forthou hast borne the Saviour of our souls. PE: Author, Publisher, Entrepreneur-How to Publish a Book (2012, Nononina Press, 314 pages) by Gary Kawasaki and Shawn Welch is breezy book which details the trials and tribulations of publishing a book. Kawasaki’s experience writing eleven previous books, which have included entrepreneurial, motivational, and technical topics, combined with his colloquial writing style helps make makes this complex publishing system understandable without resorting to the trite “For Dummies” approach. Kawasaki’s inspiration for writing APE stems from his difficulty even as an established author to get 500 promotional e-books authorized while working through a traditional publisher and the I-Tunes store. Friends suggested that Kawasaki investigate the advantages of self-publishing. Alas, self-publishing is not as easy as just cranking out a manuscript, uploading it to an on-line seller and raking in the profits. Although the media buzz is that dead tree editions are history, but e-books only account for 10% of publishers sales. So a prospective author should not totally discount the importance of getting a book printed. Kawasaki’s quick survey of the history of publishing shows how computers and the internet have the potential for democratizing the dissemination of publication. But APE is not simply a fanfare for the common man penning a tome. The authors (though it seemed like just Kawaski’s narrative voice throughout the book) point out the pain and pitfalls of preparing a manuscript for publication. But APE offers concrete suggestions on how to embrace the roles as author, publisher and entrepreneur to get their work onto readers’ bookshelves (or e-readers). Kawasaki is an enthusiastic proponent of what he terms artisanal publishing (self-publishing). Artisanal publishing requires greater involvement by the creator of the book but also allows for more control and greater profit potential (albeit without the traditional publishing “Advance Fee”). It was surprising to learn that 150 years ago Walt Whitman self published Leaves of Grass. Kawasaki gives a balanced view of the advantages and disadvantages of traditional publishing and the brave “new” world of artisanal publishing which leverages the internet and just-in-time manufacturing techniques to a self publisher’s advantage. APE is good about not favoring one source or platform. The book strives to give balanced appraisals of both electronic publishers and author-service companies producing hard copies. By citing concrete examples, Kawasaki points out that decisions on how to publish are dependant on market, content, and how much entrepreneurial involvement an author desires. I became acquainted with Guy Kawasaki through his prolific posting on the Google + platform. APE shows how Kawasaki puts aspects of guerilla marketing of his works and social media publicity into action. Do not mistake APE as being a pollyannish paean to artisanal publishing. Kawasaki forthrightly shared details regarding self-publishing experience with his prior book. Six months of self publishing sales of What the Plus! : Google + for the Rest of Us were quickly eclipsed by a smart, concentrated media blitz from a traditional publisher for a trade book edition. APE is an eminently readable technical manual on publishing with lots of white space. I was able to read it in one sitting (although I skimmed the audio book and foreign publishing section). As a lover of aphorisms, I appreciated the pithy quotes at the start of each chapter as well as punctuating the prose. As an e-book enthusiast, I appreciated the hyperlinks in the PDF edition, though this version did not display well on my Kindle 2. There were a few aspects of APE which I did not like. Some of the information struck me as cut and paste filler, such as the CIA’s listing of the top 25 most populous countries. While the tips on Google + were relevant, they seemed cribbed directly from Kawasaki’s prior book. Some of the asides written in the book sound as if it was taken from dictation (e.g. Walkerville Publishings proximity to the second best baseball team in 2012). Although I am sure that Kawasaki and Welch put plenty of thought into their title and cover, to me it can be quickly mistaken as “How to Publish a Book” APE. APE: Author, Publisher, Entrepreneur is an invaluable book for prospective authors who are keen on getting a nuts-and-bolts guide on how to publish a book. The United Nations recently voted 138-9 (with 41 abstentions) to elevate "Palestine" with non-member state status. Before delving into the meaning of according observer status it is worth taking a Palestine Pop Quiz. Since "Palestine" is comprised of two separate exclaves, the separate areas (Gaza and the West Bank) with separate governments (Gaza's by the terrorist inspired Hamas and the West Bank by Fatah) . So its territory stability is dubious. And both Gaza and the West Bank use the Israeli Shekel as its currency. The state as a person of international law should possess the following qualifications: a) a permanent population; b) a defined territory; c) government; and d) capacity to enter into relations with the other states. Clearly, Palestine in lacking on several scores. The permanent populate requirement is interesting since Palestinian leaders frequently demand that their residents become citizens in the state of Israel. The territorial item is tricky not just because of the two exclaves. The signed Israeli-Palestinian Interim Agreement (1995) proclaims that the Palestinian Legislative Council lacks jurisdiction over "issues that will be negotiated in the permanent status negotiations: Jerusalem, settlements, specified military locations, Palestinian refugees, borders, foreign relations and Israelis". Without control over borders, it should fail the territory test. The [Palestinian Legislative] Council will not have powers and responsibilities in the sphere of foreign relations, which sphere includes the establishment abroad of embassies, consulates or other types of foreign missions and posts or permitting their establishment in the West Bank or the Gaza Strip, the appointment of or admission of diplomatic and consular staff, and the exercise of diplomatic functions. [Article 9, paragaph 5]. Moreover, Article 4 of the United Nations Charter mandates that "Membership in the United Nations is open to all other peace-loving states". How does that work with Palestinians who have routinely rejected a two state solution, engage in terrorism and vow to push Jews in Israel into the sea? So if agreements and law mattered to the United Nations, Palestine should not qualify for non-member state status. Some sophisticates like John Batchelor claim that the U.N. non-member state status is the equivalent of a Junior Membership in a Country Club. Non-Member states do not have a vote in the U.N. General Assembly but can raise resolutions by itself and participate in international organizations. Palestinians conflated this U.N. vote as international legitimization of its state status, albeit in unofficial status. But the real reason for this move may have been Palestinian participation in international organizations. Expect "Palestine" to accuse Israel of genicide, despite the terrible tactics which Palestinians use in their indiscriminate missile attacks on Israeli civilians. Then there was the UNESCO proclamation that the Jewish Cave of the Patriarchs and Rachel's Tomb in the West Bank are actually Muslim holy sites. The Israelis can rightly conclude that any agreements with Palestinians are worth the paper that they are printed on, as the international community will conveniently ignore limitations when it so chooses. Moreover, it confirms that Palestinians have no interest in negotiated peace and seek to wipe Israel off the map. Congress has passed a law which forbids funding any agency that gives full recognition to Palestinian statehood. But knowing the way Attorney General Holder operates as well as the feckless foreign policy of the Obama Administration, adhering to the law is about as assured as the UN observing the Montevideo Convention. In one month, unless Congress and the President can agree upon a solution, sequestration will occur which will automatically make an across the board 10% budgetary reduction. In the District of Calamity, this willy-nilly cost cutting is know as going over the fiscal cliff. It is worth noting that all of the savings which the White House offers are vague and in the future. So what do conservatives think of this "plan"? Think of Charlie Brown trying to placekick the football with a conniving center like Lucy. Maybe we should not take Mr. Obama's first proffered plan seriously. Charitably, it might be an opening bid. Maybe Mr. Obama's pronouncement during the debate the sequestration will not happen alludes to political omnipotence. More likely, President Obama is posturing and forcing the fiscal cliff is a strategy to blame Republicans either for the resulting taxes or for the wrecked economy when we go over the fiscal cliff. Then the White House can look "reasonable" by trimming their outrageous opening offer by a third and still blame what Mr. Obama has termed "the enemy". Well, President Obama's proposal was not taken too seriously on Capitol Hill. Senate Minority Leader Mitch McConnell (R-KY) laughed at Treasury Secretary Tim Geithner when the White House's "Modest Proposal" was presented last week. McConnell opined that Obama made an outlandish proposal that should not be taken seriously and was a step backwards. Moreover, the Senate Republican leader proclaimed: "President Obama can't get everything that he wants. Those days are over." President Obama played Campaigner-in-Chief by pitching his opening offer at a toy factory near Philadelphia, comparing uncooperative Republicans who were Scrooges and going to give middle class folks lumps of coal in their stockings. The urging the wealthy to pay "their fair share" class warfare is rich, as there is no way that the top 2% of taxpayers will be able to cover the $166 billion tax hike in 2013. Some have suggested that Republicans should take President Obama at face value and then vote "present" on his outrageous offer. Of course, there are not enough Democrat votes to ensure passage in the House, but much like the Obamacare bill, a handful of squish Congressmen can be "bought off". A better tact might be to take Guy Benson's suggestion and pass the Simpson-Bowles bi-partisan deficit reduction plan, which the Obama Administration commissioned and was hailed by an adoring Lamestream Media and then promptly abandoned. But unless Congress and the President get serious about avoiding the fiscal cliff, it might be Thelma and Louise time.